Create Your Personal Manifesto NOW!!! I have to admit, manifestos really get me pumped up in a big way. The words inside a manifesto are just rocket fuel combined with tons of rock solid accountability. It's interesting how many things actually get done when you have a clear plan to put them into play. I am presently working on my own manifesto and I plan to debut it here when it is done. I will not take too much time on it, I just want it to be full of the things that are most important to me combined with a concentration on helping others. Today I had lunch with one of my good friends and as I sat across the table from him I really felt his hunger to succeed, but more than that, his dedication to completely eliminate what does not serve him. We all have choices in life and we have to continually rearrange and rethink things so that all goes well. The strange thing, is that when things don't go well is when we learn the biggest lessons. 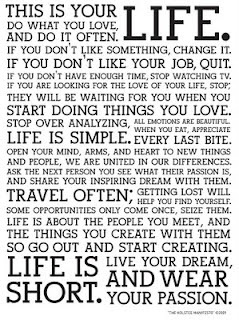 I would not be able to sleep properly tonight without knowing that I have shown you my current favorite manifesto. 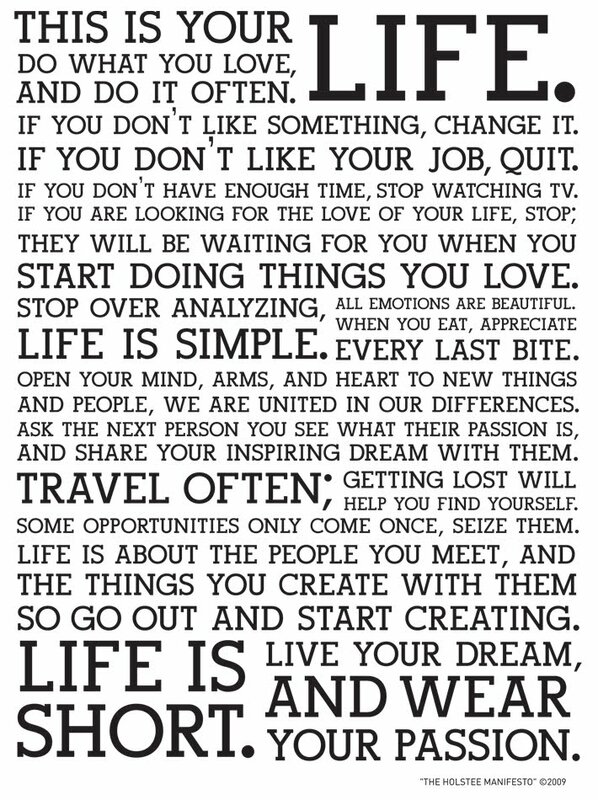 It comes from a new company called Holstee. It speaks for itself and with any luck it will ignite you just a little bit. Keep digging in my good people!!! !By the way, any support you can give to this cool new company would be incredible. They are passionate and full of life force.